Pleasant milk flavour chewable tablets. Zinc aids in regulating cell growth and development. Zinc supports protein synthesis within the body. 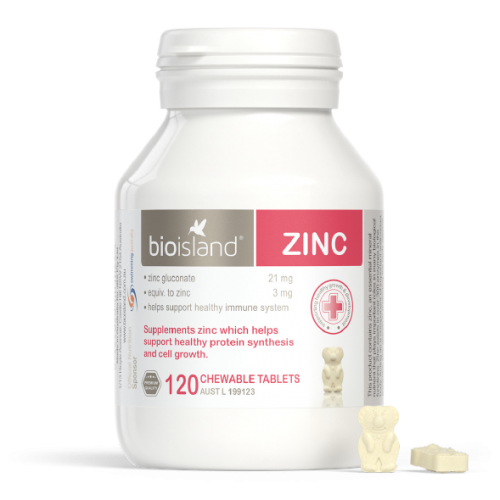 Zinc assists the body’s natural immune system and is an important nutritional antioxidant. Zinc helps to maintain healthy skin, visual function and normal blood sugar levels in healthy children. Children 9-12 years take 2 tablets, or as directed by your healthcare professional. *Tablets to be chewed. Recommended for children who can thoroughly chew and safely swallow without supervision. For children under 3 years, please crush the tablet before chewing. Ostelin Kids Vitamin D and CalciumVitamin D and Calcium help in the development and maintenance of..
Zinc is essential for people growth and development of young children. Mothers who do not have enou..
Swisse Kids Calcium + D3 Swisse Kids Calcium + D3 is a premium quality, sugar free, tooth frien..